Day two of Electra Mining Africa focused on the launch of new technology and innovations at the show. More than 60 products were reviewed across three categories. Kal Tire’s Gravity Assist System received top honours in the category of International Mechanical and Technology Innovation, mainly for its simplicity and effectiveness. The average mining tyre has a lot of lug nuts. Until now, support for the hefty 36 kg torque gun came through the sheer brawn of the tyre technician. Today, the Gravity Assist System essentially renders the activity and the torque gun ‘weightless’, making the process much more safer, efficient and precise. The system reduces common risks associated with torque gun tasks, including pinched fingers, muscle strain and fatigue. This is the first year Electra Mining Africa is launching these awards to recognise new technology and innovations coming from both within South Africa and internationally. Early 2016, the Gravity Assist System also received an award from a leading international mining magazine. 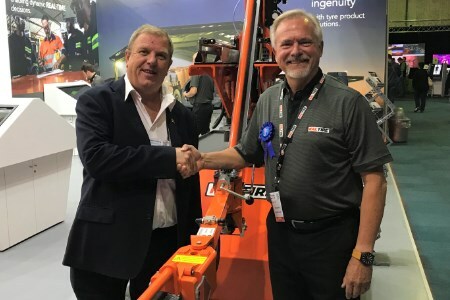 Kal Tire’s Innovation Centre in Canada has now created several exclusive and patented products that have been launched and field-tested in Canada, South America, Australia and Africa.